One summer, I had the privilege of observing U.S. Naturalization ceremonies as part of my work with the New Americans Voter Project, an APANO co-sponsored program. On the blistering August day at the U.S. Citizenship and Immigration Services building at NW 14th and Overton (Portland, OR), I was in a room full of 33 immigrants from 17 different countries. They had already been woven into the American and Oregon fabric but now chose to affirm their status as “U.S. citizens” under the eyes of the law and government. 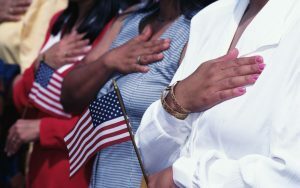 Normally, a naturalization ceremony should be celebrated and inspire awe and pride in this experiment called America. I felt hopeful and inspired by the waving of little American flags as their families waited to capture the special moment for their loved ones. My own Chinese family was naturalized in 2006 (I am the only U.S.-born member of my entire lineage) and it was an exciting moment for us all. But what I felt in addition, as I watched the recent ceremony, were feelings of tension, sadness, and internal conflict – conflict that hadn’t previously existed. I used to be unequivocally proud to be American. Chalk it up to naiveté, or maybe idealized belief that our best times are still ahead of us, but I truly believed that despite America’s imperfections, there was endless possibility in America, in its diversity, in what its diversity could accomplish in our democracy. I believed that diversity was embraced – was our destiny, our greatest strength to be cherished, not disdained. Lately, however, it hurts my heart that the more I learn about my country, the more I grapple with the underlying question: Am I proud to be an American? Afterall, my Chinese parents would not be where they are now without the kindness they found in Huntsville, Alabama upon immigrating in 1992. How much credit can I give to a country who helped my uncle emigrate from China to Canada in 2014, inspired by the society he saw on an academic exchange in Rolla, Missouri? For me and many others, the results of the 2016 elections shocked the moral conscience of America (for some, but not nearly enough) but it was anything but shocking: after all, this is not the first time a misogynistic, racist, homophobic, classist, anti-immigrant tyrant has been elected to the White House. But what hurt the most was that it felt like a rejection of the incredible, diverse people that color my life as well as who I am and what I stand for, too. I was heartbroken. I was hurt in an unspeakable way, a feeling that something once thought unshakeable had been unmasked as something fragile, something delicate. It revealed how little (if at all) our society has grappled with our complicated history and not yet found avenues for being better. It exposed that we have a much longer way to go than we thought. We are all made to feel like outsiders at some point. In Portland, some of us are even made to feel like outsiders in our own hometowns. I carry the burden of feeling like I represent my race, my ethnicity, my people’s past and present. I’m exhausted. I’m tired of the inane debating over the legitimacy and existence of immigrants, over who gets to be included in society, over the worth of human beings. I’m tired of hearing “well-intentioned” rhetoric denouncing the current hate and vitriol in our society as “Un-American” or somehow against American values and principles, as if our country’s history isn’t rife with examples of unwavering hate. The good does not wash away the bad and vice versa. But xenophobia and prejudice is as American as America can get. For those in the ceremony, to what set of responsibilities, histories, and privileges did these New Americans just swear an oath of allegiance? As I sat there nervously clapping, did it pain other Americans as much as it did me that these immigrants were pledging support to a government that does not want them? I’m sure the immigrants were aware of this complicated dilemma – is there not something inherently progressive and accepting about immigrants who leave behind their lives and culture to adopt new ones in the U.S.? Are immigrants not the most accepting and understanding people of other peoples and cultures, the most realistic and sober-minded when it comes to the challenges and hardships that accompany dreams of a better life? At the end of the day, these New Americans were smiling and proud of their accomplishment. They announced their name to the audience, their origin countries, and, if so inspired, gave a remark about what that moment meant for them. Some even registered to vote! Maybe this tension, this conflict, is a central part of the American experience. America is both a welcoming and unwelcoming place, but we engage and fight in this never-ending struggle for who is included in our society. If America isn’t a welcoming place, then America is a place that doesn’t see the beauty of its multicultural potential. If America is a welcoming place, then diverse identities will be embraced, not merely tolerated. 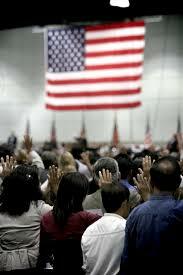 Immigrant Americans would not be half their original culture and half American, or half anything, but twice as much. “Oh you speak with an accent? That’s wonderful! That must mean you speak more than one language.” Being a “New American” means becoming a part of a larger struggle and assuming an even bigger part of the American inheritance. Becoming a New American means taking a rightful space in the political process to shape our nation. If we don’t, then what kind of world will greet future generations? If we do, then what is possible? In America, future generations will be darker and more beautiful than ever before — what will you do to ensure that they’ll belong? 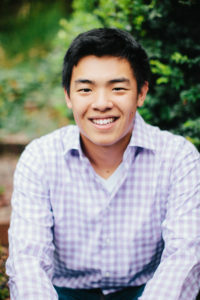 Robin Ye is the Lead Political Organizer at APANO (Asian Pacific American Network of Oregon). He is Chinese-American and the only member of his entire family born in the United States. Robin grew up in Beaverton, Oregon and attended high school at the International School of Beaverton. Robin is an organizer by trade and a policy wonk and political junkie at heart. He earned his bachelor’s degree in Public Policy and Human Rights (minor) from the University of Chicago in 2016. He has a passion for civic engagement, social justice and electoral politics. Robin has worked as a political organizer on statewide campaigns in Oregon and was a healthcare union organizer at SEIU Local 49 before joining APANO, working statewide to help workers form their unions for better pay and benefits. He currently manages APANO’s growing c4 political program, helping build Asian and Pacific Islander political power in Oregon. He has also spent time interning at the Environmental Protection Agency, Chicago Public Schools, and Oregon Senator Jeff Merkley’s office. In his free time, Robin is an avid sports fan and enjoys eating, hiking, cats, podcasts, writing, and comedy. APANO: Established as a 501c3 nonprofit in 2010, the Asian Pacific American Network of Oregon (APANO) is a statewide, grassroots organization uniting Asians and Pacific Islanders to achieve social justice. We use our collective strengths to advance equity through empowering, organizing and advocating with our communities. APANO’s strategic direction prioritizes four key focus areas: cultural work, leadership development, community organizing, and policy advocacy and civic engagement. Through APANO’s arts and cultural work, we create a vibrant space where artists and communities can envision an equitable world through the tool of creative expression. We strive to impact beliefs, center the voices of those most impacted and silenced, and use arts and cultural work to foster unity and vitality within our communities. Learn more about APANO on our website and read more writings by APANO members on Medium. EPALF IS BACK! Join us for the 2nd Annual East Portland Arts & Literary Festival on October 19-20, 2018 at PCC Southeast, hosted by APANO’s Arts & Media Project. Presented in conjunction with IntersectFest at PICA, EPALF elevates the voices of Portland’s artists of color. Through main stage performances, interactive workshops, an epic book & craft fair, kid-friendly activities, and more, EPALF will explore themes of healing, health, and wellness in alignment with this year’s MicCheck! series. All are welcome to this eastside festival boasting the quirkiest acronym around — for the record, it’s pronounced ee-palf — and get ready for a full weekend celebrating artists of color in our community! Suggested donation is $5, and no one will be turned away from lack of funds. RSVP at bit.ly/epalf18rsvp and share the Facebook event at bit.ly/epalf18. This event is part of MicCheck!, a summer cultural event series organized by the Arts & Media Project (AMP) at the Asian Pacific American Network of Oregon. MicCheck! utilizes the arts to illuminate pressing issues affecting Asians and Pacific Islanders and multiracial communities of color. Visit www.apano.org/mic-check to learn more. Honor and center artists of color: Artists of color have been historically underrepresented in art history and dominant arts institutions. EPALF provides a distinct space by and for artists and cultural workers of color to share their stories and expressions, intentionally cultivating relationships between Asians, Pacific Islanders, and multiracial communities of color. Address real community concerns: Centering mental health, healing, and wellness — in alignment with MicCheck!’s 2018 theme, selected by members of APANO’s Arts & Media Project — EPALF kickstarts conversations on issues that impact our communities now. For example, due to barriers such as language, limited access to care, and strong cultural values of self-reliance and fear of shame, APIs are three times less likely to seek mental health help than white Americans. Invest directly in East Portland’s creative economy: East Portland has been chronically under-resourced — major arts institutions such as museums, performing arts venues, and other arts hubs are overwhelmingly located in downtown Portland, a 45-minute bus ride away from our community. EPALF financially supports local artists, cultural workers, and small businesses, including driving traffic to restaurants and other enterprises in the Jade District. Transform dominant narratives about East Portland: Many damaging perceptions about East Portland — such as that it is inherently unsafe and that it is a urban wasteland — continue to threaten its opportunities for growth. EPALF creates a vibrant setting to counter some of these perceptions and break down barriers to its financial and social growth.